Dr. Onyx Adegbola, MD PhD is in the house! Which house? Cases de Sante. 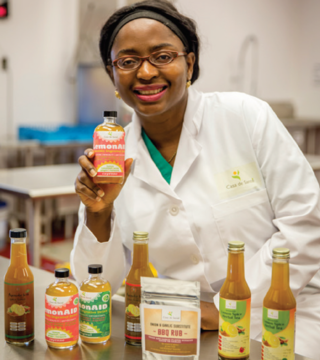 Dr. Adegbola is the founder of this extraordinary company which creates and markets small-batch, low-FODMAP products specifically designed to help address the needs of people with Irritable Bowel Syndrome and other digestive challenges – products which are FODMAP friendly certified. FODMAP is an acronym for Fermentable Oligosaccharides, Disaccharides, Monosaccharides and Polyols. These are the scientific names for four types of carbohydrate molecules found naturally a variety of fruits, vegetables, grains, legumes and milk products, which irritate the digestive system and can exacerbate IBS. The low FODMAP diet is designed to limit foods that contain these molecules. Onyx was inspired to start Casa de Sante when she saw not-only the benefits of a Low-FODMAP diet but also how difficult it can be to successfully follow one. The diet’s highly restrictive nature requires a lot of planning and since most on the shelf foods are decidedly not Low-FODMAP friendly, it also requires a lot of meal preparation. Casa de Sante make it easier for people to successfully follow a Low-FODMAP diet with ready-made artisanal products like Granola, Salsas and Spice mixes along with meal plans, recipes and information resources. Practitioners, recognizing the valuable role Casa de Sante is performing, are among Casa de Sante’s biggest supporters. And Casa de Sante is supporting them back with a practitioner affiliate program, offering practitioners a 20% commission on all product purchase. Casa de Sante is also making their recipes and resources available to MBODY360 practitioners with the Casa de Sante Low-FODMAP nutrition plan now available in MBODY360. The Casa de Sante meal plans were developed by Akanksha Gilbertson, MS, CNS, a board-certified nutrition specialist who is expert in treating chronic IBS patients using the low FODMP approach, and worked as well with Australia’s Monash University team (they founded the FODMAP diet) on research papers while studying for her masters at UCLA. 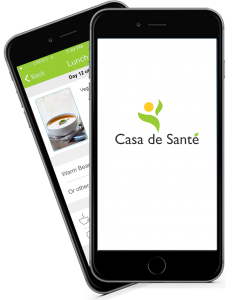 MBody360 is proud to provide the underlying mobile application and management system to Casa de Sante, an application which includes free low FODMAP recipes developed by Jody Garlick, RD, LDN, a Digestive Health Expert and Owner at South Hills Nutrition in Pittsburg, Pennsylvania. Jody is an integrative and functional nutritionist specializing in digestive and autoimmune disorders. Casa de Sante also works with FODMAP Friendly to ensure their products are certified Low-FODMAP and the best they can be for those with IBS. FODMAP Friendly is a world leader in assisting people with IBS to manage their symptoms with the low FODMAP diet. They are based in Melbourne, but assist people worldwide with simple and practical tools that can be used by dietitians, nutritionists, the food industry and the general public. These tools help make daily life simple and enjoyable while on a low FODMAP diet. Dr. Adegbola is a busy working Mom, with three triplets, and this awesome new business! MBody360’s team couldn’t be more proud to contribute to the success of Dr. Adegbola’s meaningful business, which will no doubt help many people as low FODMAP gains even more visibility, and the impact of a better diet becomes more evident to the physicians, dieticians and others who are guiding their patients toward a much better life. Find out more at http://www.casadesante.com.